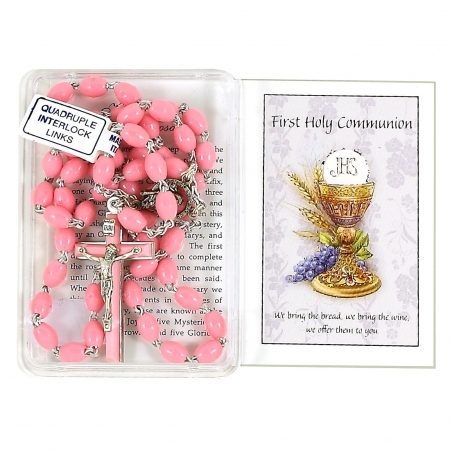 Very nice First Holy Communion gift, a pink rosary with an instruction card. This communion rosary is a beautiful religious article used for prayers during Eucharistic adoration. Silver colour chain with pink beads. The oval junction is a picture of a little girl praying. The Crucifix is silver colour and in 3D. Presented in a clear transparent box with the words "First Holy Communion" and a Chalice symbol on the box.